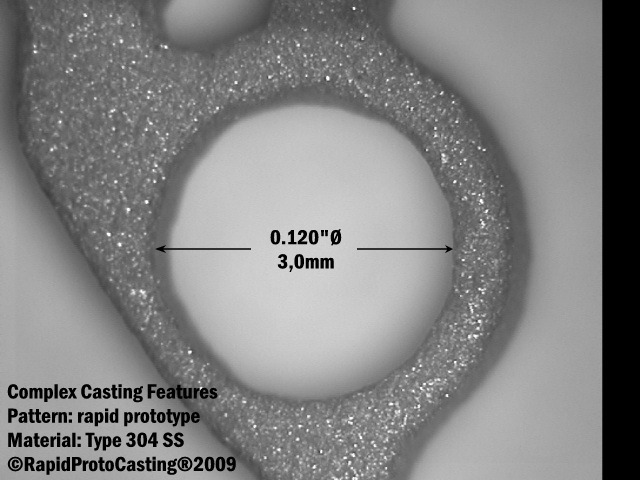 Engineered Casting and Processing Specifications. Model Based Definition where all dimensions, GD&T, notes and product manufacturing information are included in the CAD model. Product manufacturing information includes material type, processing requirements and post-processing requirements. RapidProtoCasting will need a printout of critical dimensions, GD&T and product manufacturing information. 3D SolidModel plus 2D drawing where the solid model defines the product dimensions and the 2D drawing is used to define critical dimensions, GD&T and product manufacturing information. 2D drawing incorporating all dimensions, GD&T and product manufacturing information. Please note that the specifications used for investment castings should be specific AMS, ASTM or MIL-STD specifications intended for castings. ensure the delivery of complex investment castings meeting customer requirements. Fulfilling the engineered dimensional requirements for a precision investment casting is a function of the casting accuracy, casting precision and the dimensional tolerances. Accurate Castings Casting accuracy is established by the starting pattern size and metal shrinkage during cooling relative to the design dimension. Precision Castings Casting precision is a function of the investment casting process. RapidProtoCasting’s proprietary face coat and block mould ceramics technology delivers precision superalloy castings with the finest surface finish. Process Capable Castings Process Capability is the statistical comparison of the dimensional accuracy and precision of the castings and the dimensional tolerances. RapidProtoCasting’s proprietary investment casting process delivers the most precise complex cobalt-chromium, titanium, copper, stainless steel and Inconel castings. RapidProtoCasting’s pattern management, lost-wax investment processes and casting finishing processes provides the highest definition and surface finish for titanium, copper, stainless steel Inconel and cobalt-chromium castings. 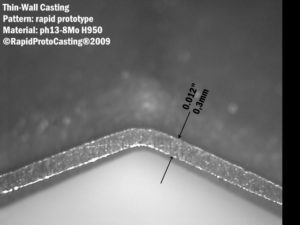 RapidProtoCasting begins by vacuum induction melting premium barstock meeting rigorous ASM, ASTM and MIL-STD material specifications for chemistry, hardness and strength. Most of the superalloys we melt are VIM/VAR, VIM/ESR or VIM/EBR produced and all of our in-stock material meets DFARS 252.225-7014 requirements for US production. Hot isostatic pressing and heat treatment at NADCAP certified facilities and mechanical properties testing at ISO9000/AS9100/NADCAP testing labs ensure optimum material properties. for superalloys used in aerospace, medical and industrial applications include specifications for engineering dimensioning and GD&T, superalloy metal melting, casting heat treatment, casting metal chemistry and mechanical properties, casting surface treatment and inspection and testing of investment castings.